... but it's the professional expertise of secretaries, administrative assistants, and receptionists who keep the engines running. The role of secretaries and executive assistants have been recognized since the end of World War II, when industry boomed in the early 1950's. Jobs were also plentiful, as women were called upon to take on the role as assistants to the new captains of industry. Today, their role has become increasingly important to day-to-day operations of companies worldwide. While Bosses Day is fixed to October 16 every year, Secretary's Day is a moveable feast celebrated on a Wednesday in the fourth week of April during Administrative Professionals Week. In 2019, admins and secretaries will be honored on Wednesday, April 24th in the US, UK, and Canada. Meanwhile, South Africa has it's own Secretary's Day celebration observed on the first Wednesday in September, this year celebrated on Wednesday, September 4, 2019. Worldwide in the modern workplace, new titles such as Administrative Assistant and Executive Assistant represent a legion of women - and men - who are highly skilled and educated. Far from just possessing the stereotypical "interpersonal and communications skills", admins are responsible for office duties ranging from expert computer troubleshooting to managing new hires. Meanwhile, a gift component to the day continues to presented a challenge for bosses and executives. How do you honor assistants without being sexist or condescending? This is especially true as more men are increasingly hired for admin positions. In larger companies, it is the smart department head who will take an entire administrative staff out to lunch to celebrate the day. Show your favorite admins the respect they deserve with the help of online resources offering gift ideas, e-cards, plus info, fun facts, and background history of Secretary's or Administrative Professionals Day. Keepers of secrets: admins in pop culture. 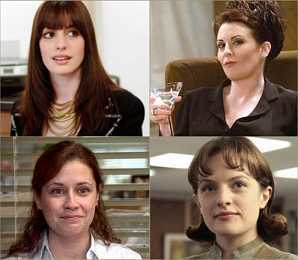 • Favorite admin assistants from American pop culture include Andrea (Anne Hathaway) from "The Devil Wears Prada", Karen (Megan Mullally) from "Will & Grace", Pam (Jenna Fischer) from "The Office", and Peggy (Elizabeth Moss) from "Mad Men." • In medieval times, a secretary (from the Latin word "secretum") worked at the royal court as a trusted confidant who could always be relied upon to keep a secret. • Today, 22 million secretaries/administrative professionals are part of the US workforce. • Although the number of men who take on admin and secretarial positions continues to rise, women continue to dominate the field at 85% (female) to 15% (male). • The preferred title for those who hold the position is Administrative Assistant, followed by Executive Assistance, and Administrative Professional. IAAP Homepage - The official site of the International Association of Administrative Professionals, featuring membership info, education and training resources, and related resources with special observance suggestions and gift ideas for Administrative Professionals Week.. Administrative Professionals Day or Secretarys Day - A brief overview of the history of the day, with gift suggestions and related resources. Secretaries and Administrative Assistants - Occupational Outlook - Check out the necessary skills and qualifications, current job outlook, and salary ranges provided by the U.S. Department of Labor. Care2: Secretaries Day Ecards - Cute, clever and mostly animated e-cards featuring a virtual typing test.